Quick question: which would make you more upset– leaving the house without your phone or leaving the house without underwear? Be honest. Chances are you’d be desperate if you were without your phone all day. Even a few hours without a phone has most people twitching, and it’s not just young people. The cell phone is our most prized possession (when it works) and it’s the way most of us connect with our friends and loved ones, learn about the world, and go about our daily lives. Why would you let it go dead? You wouldn’t, and that’s why airports are littered with people sitting on the floor near outlets, and why people at your office occasionally walk around asking if anyone has a charger. This is why you need a power bank. A power bank is mostly just a big battery with just enough electronics involved to make sure it charges safely and puts out power smoothly. Generally they have USB ports to make them compatible with nearly any phone, so you’ll still need some sort of charging cable. The best power banks have plenty of capacity, so they can handle multiple phone charges, and put out 2.1 amps of power to handle quick charging of phones and tablets. It’s even better if there are multiple USB ports so you and a friend can be charging at the same time. Power banks can be found at the local drug store and personally I think it’s a great idea to get half a dozen of these cheapies to keep in the car, in a desk drawer, etc. However, they’re usually no more than a rechargeable AA in a case, and that won’t get you back to a full charge. 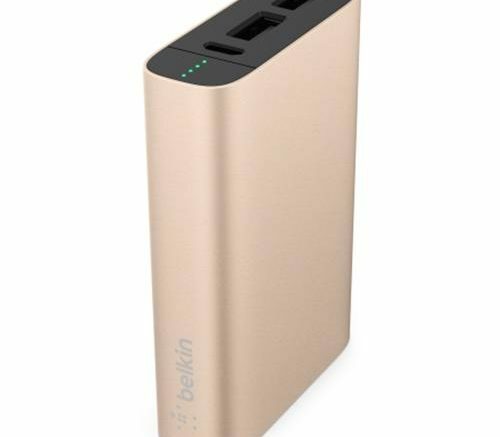 When you’re serious, you need something like the Belkin Mixit Up power bank you see at the top of this article. And that isn’t even the top of the heap- there are really powerful power banks you can take with you while camping or if you plan to be out in the desert for a while. The best part about all of this is that you can find a literally humongous selection of power banks and chargers at Solid Signal. You don’t need to worry about going through third-party sellers or any problems with customer service, like you’re going to get at some of the larger, more river-oriented web sites. When you call Solid Signal for support, you get technicians in our 100% US call center who are ready to help in any way they can! Honestly, I looked around my home office and I have four power banks. I pack all of them when I travel. I also have one in my car in case of emergencies too. This is cheap insurance and it means that no matter how old my phone is, or even if I forgot to charge it the night before, I’m not going to lose signal no matter what. That’s real peace of mind and when you look at the low cost of most power banks, it’s definitely worth it. NICE AND EASY: Does your cell carrier need to approve your booster?